I felt like Roy Frederick was waiting impatiently for someone to come find him, his body never recovered from the killing fields on which the memorial came to be built. Under the warm sun and surrounded by the peaceful green fields of rural France, my wife and I had made our way from Paris to Amiens and then on to Villers Bretonneax as an act of remembrance for my father’s uncle who never returned from World War 1. Ironically, Roy went to war with a bullet scar already showing on his foot, perhaps the result of an accident while hunting or working as a stockman. Or maybe he belonged to gun club, as did many of those recruited around the same time, into the 36th battalion. Ambrose Carmichael, Minister for Public Information led a recruitment drive from the rifle clubs of NSW in early 1916. The battalion became known as ‘Carmichael’s Thousand’. Carmichael led by example and enlisted as well, serving in the battalion as a captain. Whatever the source of his bullet scar, he was to see much, much worse in his short but bloody tour of duty along the battlefields of Europe. While Roy never returned, his scant belongings did and among them were two religious books. Our family history is not particularly religious but it sounds as if Roy may have found some solace in faith in the face of death. The rest of his story, as gleaned from Australian war records, follows and is my contribution to Anzac Day… Lest we forget. Roy Frederick Hallett enlisted for service in World War 1 in Rutherford on October 30 or 31, 1916, aged 18 and one month. 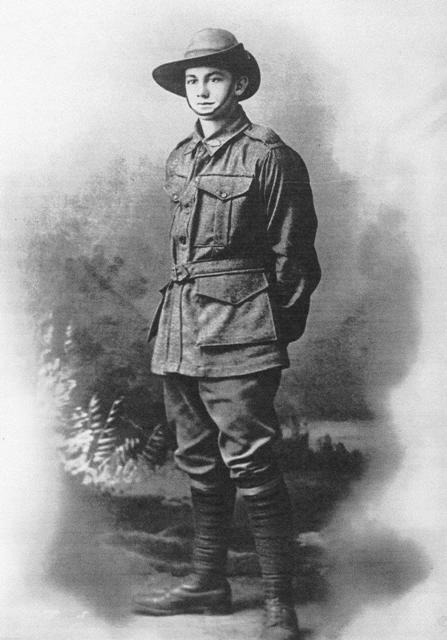 He recorded on his enlistment papers that he was born in the parish of Singleton in the county of Robertson, NSW and his next of kin was father John Hallett of Baroona, Singleton. On another copy of his enlistment papers, there are attempts (over the course of time) to update the address of his next of kin and these included White Falls, Baroona, via Singleton and later George St, Singleton. He crossed out the section in which enlistees would agree to give two fifths of their wage to their wife, indicating he was single. He had first applied to enlist in Singleton on October 25, 1916 and on that form gave his occupation as stockman. Details from his medical examination that day indicate that Roy was 5ft 7 inches, weighing 10st 7lb with a chest measurement of 36 inches. He had a medium complexion with brown eyes (D6 vision in both eyes), brown hair and the report lists distinctive marks to be: “bullet scar on dorsum (upper surface) right foot, scar on front of right thigh.” A medical history form later records that his physical development and pulse rate were ‘fairly good’. He gave his religion as C of E and signed his enlistment RF Hallett. Moving through Sutton Mandeville and Lark Hill, he proceeded to Rouelles, France, ‘marching in’ on July 7, 1917 before marching out to his unit on July 16. On July 18 he was ‘taken on strength’ which means he was joined to the 36th Battalion which was located in Belgium. He had earlier been allocated to the 56th Battalion 8th reinforcements but this was changed to the 36th Battalion 5th reinforcement and then 6th reinforcement. 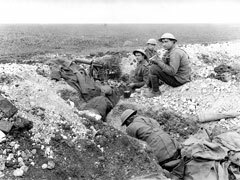 The 36th Battalion at this time was in the Ypres sector of Belgium and had taken part in its first major battle, of Messines, launched June 7. Roy would have arrived after this but in time to take part in the brutal Battle of Passchendaele from October 12. This was fought in thick, heavy mud which fouled soldiers’ weapons. The battalion achieved its objective but was forced to withdraw due to ineffective artillery support and exposed flanks. The next five months was one of rest, training, labouring and service in the line during which time Roy had a stint in hospital and on leave. On December 27, 1917, his record indicates he was admitted by the field ambulance to the Casualty Clearing Station ‘sick’ with the condition listed as PUO or pyrexia of uncertain origin. This would have been a fever that had persisted for some time. He left to return to duty on New Year’s Eve 1917 and was back with his battalion by January 3, 1918. On February 20, 1918, Roy was given leave and went to England, returning to his unit on March 10, 1918. By this stage it is about 17 months since he enlisted. The Germans made their final great offensive in the spring of 1918 and Roy with the 36th battalion was deployed to defend the approaches to Amiens around Villers Bretonneax. They took part in a major counter attack at Hangar Woods on March 30 and helped to defeat a major drive on Villers Bretonneax on April 4. Tragically, Roy was killed in this engagement and his body was not recovered or was buried in an unknown grave. The Australians went on to win a decisive battle in the area on April 25, 1918, ending the German offensive, and on April 30, 36th Battalion was disbanded to reinforce the other two battalions in the dwindling 9th Brigade. A machine gun post on Hill 104, the place the Australian War Memorial, Villers Bretonneax now stands. The final entry on his casualty sheet was: ‘Pte Killed in Action – France – 4.4.18’ Someone has written on this line in pen, ‘Field’. This no doubt indicates that he died on the field of battle and not later in a casualty station. Roy was 19 years and 8 months when he died. After his death, his family received a variety of correspondence from the Department of Defence. A Memorial Scroll and Kings Message were received by father John on November 17, 1922, and a receipt for this was signed by him. A Memorial Plaque was also received at some point. The Victory Medal was received by the family on May 22, 1923 and was signed for by mother Adelaide. Adelaide was also able to claim a pension due to the death of her son, and an amount of two pound per fortnight was granted from June 16, 1918. A single parcel of Roy’s belongings was sent to his family on December 17, 1918. It had been received from the Australian Infantry Kit Store in Hammersmith, London and travelled on the Australian Commonwealth steamer, Australcrag, which interestingly, continued in service until sold to the Japanese in 1923 and was renamed Misaki Maru. During WW2, it was torpedoed and sunk by the USS Barbel in the South China Sea in 1944. A will renewed on February 11, 1918, indicates that Roy left all his possessions to his mother, Addie.Other material sent to the family included a leaflet, ‘Where the Australians Rest’ (May 21, 1921) and before this, a ‘booklet re graves’ was despatched (December 8, 1919) with a ‘final notice’ sent on February 2, 1922. Later it appears a request form for a cemetery register was sent to the family on January 16, 1934 and later a cemetery register is recorded as having been sent.This may have been the roll of honour circular sent to all the families of WW1 casualties asking for information for their listing at the Australian War Memorial. A copy of the completed circular can still be viewed. It was completed by Roy’s brother, Henry Thomas Hallett who gives his address at the time as White Falls, Singleton, NSW. He indicates that Roy was educated at Whittingham Public School and that he had no other training. However, the Australian War Memorial records do not indicate a grave, but rather a listing at the Australian War Memorial, Villers Bretonneax.In fact, Roy Frederick Hallet t’s name was one of nearly 11,000, belonging to Australians killed on the western front of WW1 with no grave, to be carved into the rock of the Australian War Memorial at Villers Bretonneax. 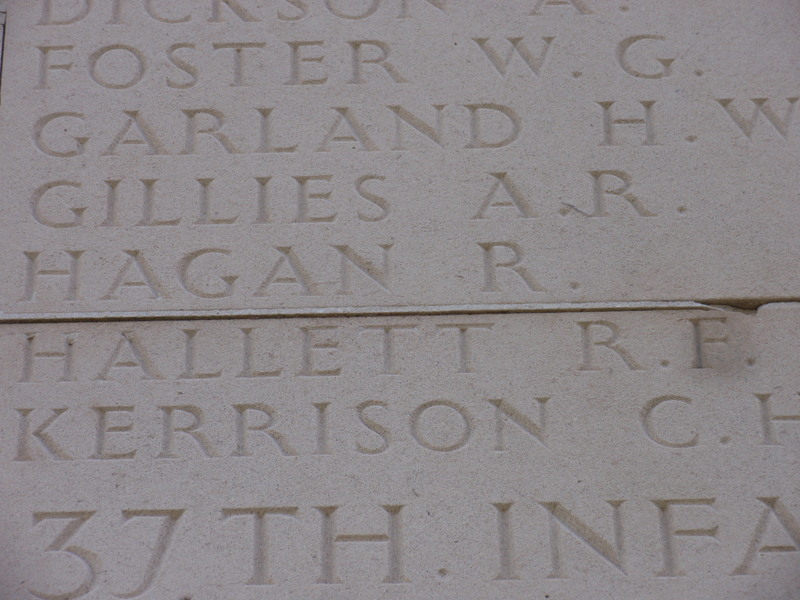 His name appears about three metres up about half way around the right hand wing of the memorial. The memorial was opened by King George VI on July 22, 1938. Posted in Australia, People, Travel, World.Tagged Anzac Day, death, reflection, World War 1. My 16 yo daughter is right now in France commemorating fallen Australian Soldiers from WW1. Walking in the foot steps of her Great Great Grandfather, lucky enough to survive a gun shot wound to his head. She too will be commemorating a cousins Great Great Uncle in Fouquescourt. They will also be commemorating 11 soldiers at Villers Bretonneax Memorial and 2 at the Cemetary on 5th Dec 2012. Such a humbling experience to honour our fallen. Some around the same age she is now. Connecting Spirits is an amazing group keeping the memory of our forefathers alive. Well done to your daughter, what an amazing experience for your daughter and thanks for the website link. My late father’s name was Darrell Roy Haggart, youngest son of Grace Evelyn (Hallett) Haggart. Mum would like to know if the photo at the top of your blog is actually a photo of Roy? It’s hard to comprehend the losses people suffered during these times, our trip was also to include a trip to Naples, Italy where Grace’s oldest son and my late father’s oldest brother Donald Cameron Haggart is buried after his death from injuries he sustained during WW2. I thought your father’s surname would be Haggart, just from my smattering of family knowledge. I had a quick chat with my mum who remembers visiting Grace in the Kurrajong area a long time ago. She remembers her as lovely person. Yes, the photo is of Roy. My aunt and uncle have the original and a similar one of my grandfather. I’ll send you an electronic copy by email. It is hard to comprehend the sacrifice involved, a reason I think why Australians continue to remember and honour despite the passage of time. I’m writing a novel in honour of Roy. As all we actually know about him is what can be gleaned from his war records, I’m starting there and reimaging him as a central character of the great dramas of those times. If I ever finish it, I hope it will be a creative testament to his sacrifice. Roy Frederick Hallett was my late father’s uncle, my mother and I were due to visit Villers Bretonneux in March this year, but unfortunately had to cancel this trip due to health issues. My mother is an avid family historian and i’m not sure if she’s seen this but I am keen to show her this tomorrow. My father spent the first part of his life at Baroona, his mother was Roy Hallett’s sister. She will be very excited to see this. That’s great Ann, wonderful to have that connection and hope your mother enjoys the article. Roy was my father’s uncle as well, as mentioned. His father (my grandfather) was Walter, older brother to Roy and your father’s mother. Fascinating working out these connections and interesting to me that even though the war took Roy’s life, it is his war records that have brought him back to life for our generation. My grandfather never really spoke of him and it was only as I traced his war records online that I caught a glimpse of who he was. Others like your mother might know more. My Uncle and Aunt in Singleton have the wartime photo of him, which is a treasure (and also of my grandfather). Have a great Anzac Day. Lest we forget. Thanks John, great to share a Great Uncle with you (my grandfather was Roy’s brother, Walter). As a child I had heard of this other brother in my grandfather’s life but it was only in the past few years that I discovered his story. I think I knew your grandfather as Uncle Harry even though he was really my dad’s uncle. I recall visiting him in Ashfield, if I’ve got the right person! An excellent article, Peter! Roy was my Great Uncle (my grandfather, his brother Henry). Great to read in detail about Roy’s plight. A lovely and moving tribute. Thanks! Thanks for this story. Very well writtent too! Thanks for the lengthy and detailed story, Pete! What a great family to belong to!